This article is about the city-planning concept. For other uses, see Edge City (disambiguation). Dadeland is sometimes referred to as "downtown Kendall", despite the fact that Kendall is part of unincorporated Miami-Dade County. A special zoning area allowed high rise development in the area consisting mostly of single family homes. "Edge city" is term that originated in the United States for a concentration of business, shopping, and entertainment outside a traditional downtown (or central business district) in what had previously been a residential or rural area. The term was popularized by the 1991 book Edge City: Life on the New Frontier by Joel Garreau, who established its current meaning while working as a reporter for The Washington Post. Garreau argues that the edge city has become the standard form of urban growth worldwide, representing a 20th-century urban form unlike that of the 19th-century central downtown. Other terms for these areas include suburban activity centers, megacenters, and suburban business districts. These districts have now developed in many countries. Spatially, edge cities primarily consist of mid-rise office towers (with some skyscrapers) surrounded by massive surface parking lots and meticulously manicured lawns, almost reminiscent of the designs of Le Corbusier. Instead of a traditional street grid, their street networks are hierarchical, consisting of winding parkways (often lacking sidewalks) that feed into arterial roads or freeway ramps. However, edge cities feature job density similar to that of secondary downtowns found in places such as Newark and Pasadena; indeed, Garreau writes that edge cities' development proves that "density is back!". There are certain factors that helped the emergence of edge cities. They are the advanced development of the automobile, which in turn led to the need for parking, escalating land values in central downtown areas, the rise of communications and the entry of more individuals into the workplace (i.e., women). [dubious – discuss] The creation of the edge city also includes political groups that aided in the creation of the edge city in a particular way. Within the edge city exists a privatized proto-government that is an alternative to normal politics. These “shadow governments can tax, legislate for, and police their communities, but they are rarely accountable, are responsive primarily to wealth (as opposed to numbers of voters), and subject to few constitutional constraints”. Shadow governments form as private organizations come to edge cities. In most cases a ‘privatopia’ is formed within edge city residential areas. Private housing development is administered by homeowner associations. In 1964 there were less than 500 associations, “…by 1992, there were 150,000 associations privately governing approximately 32 million Americans”. Edge cities have had substantial investments placed in them, edge cities are being reconstructed as much as cities have been over a century. This concept has showcased the impact that national economies have on the edge city and the surrounding areas. Through Garreau, the term edge city has provided information on how corporate players remain important to the strength of urban and regional subsets. Garreau describes that the edge city has a tendency to have a large service-orientated industry linked to the national economy. The edge city offers supplies to the local area in the form of retail facilities and consumer services. Progressively different services begin to move towards the edge city as the population of corporate businesses increase. The corporate offices fill in space in edge cities and provide connections to exterior locations if decisions are being made from those locales. Not only do corporate, service, and transportation based edge cities exist, but the innovation-driven edge cities will generate extra-metropolitan linkages. These innovative edge cities expand various corporate activities as hosts. Edge cities may create a significant growth in sophisticated retail, entertainment, and consumer service facilities, which in turn leads to a rise in local employment opportunities. The edge city has a tendency to affect the surrounding areas by procuring more opportunities within the labor market. Edge Cities are well suited to an economy which is known for a service-orientated market as well as sustaining major manufacturing sectors. Boomers (Boomburbs) – The most common type, having developed incrementally around a shopping mall or highway interchange, but develop rapidly as a whole. For example, within Northern Virginia, Tysons is a Boomer, Reston Town Center is a Greenfield, and the Rosslyn–Ballston Corridor is an Uptown. The edge city is fundamentally impossible without the automobile. It was not until automobile ownership surged in the 1950s, after four decades of fast steady growth, that the edge city became truly possible. Whereas virtually every American central business district (CBD) or secondary downtown that developed around non-motorized transportation or the streetcar has a pedestrian-friendly grid pattern of relatively narrow streets, most edge cities instead have a hierarchical street arrangement centered on pedestrian-hostile arterial roads. Perhaps the first edge city was Detroit's New Center, developed in the 1920s. Located three miles (5 km) north of the city's downtown (but within Detroit's city limits), this was developed as an attempt to relocate downtown Detroit. New Center and the Miracle Mile section of Wilshire Boulevard in Los Angeles are considered the earliest automobile-oriented urban forms. However the two were built with radically different purposes in mind (New Center as an office park, the Miracle Mile as a retail strip). Garreau's classic example of an edge city is the information technology center, Tysons, Virginia, west of Washington, DC. Edge cities planned around freeway interchanges have a history of suffering severe traffic problems if one of these freeways goes unbuilt. 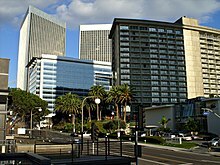 In particular, Century City, a pioneering edge city built on former 20th Century Fox backlot in western Los Angeles, was built with the long-term intent of establishing connections to both a citywide light rail or monorail system and the planned Beverly Hills Freeway. Neither project ever came to fruition, resulting in massive congestion on the surface streets connecting Century City to the San Diego (I-405) and Santa Monica (I-10) freeways, each two miles (3 km) distant. Calls by former Los Angeles mayor Antonio Villaraigosa for construction of a Wilshire Boulevard extension of the Purple Line subway led many transportation planners and Century City occupants and neighbors to call for a southerly routing of the extension that would pass by Century City on its northern leg. Edge cities emerge from originally small towns and cities that grow and expand to create the size of its current state. Typically, these small towns and cities were suburbs. Many terms are used to refer to edge cities, such as: suburban business districts, major diversified centers, suburban cores, minicities, suburban activity centers, cities of realms, galactic cities, urban subcenters, pepperoni-pizza cities, superburbia, technoburbs, nucleations, disurbs, service cities, perimeter cities, peripheral centers, urban villages, and suburban downtowns. Depending on the purpose and intent of the edge city, they may be built to serve that particular function. They may even serve to be extensions of larger metropolitan cities such as the relationship between Century City and Los Angeles. Edge cities may turn out to have been only a 20th-century phenomenon because of their limitations. The residents of the low-density housing areas around them tend to be fiercely resistant to their outward expansion (as has been the case in Tysons and Century City), but because their internal road networks are severely limited in capacity, densification is far more difficult than in the traditional grid network that characterizes traditional CBDs and secondary downtowns. As a result, construction of medium- and high-density housing in edge cities ranges from difficult to impossible. Because most are built at automobile scale, mass transit frequently cannot serve them well. Pedestrian access to and circulation within an edge city is impractical if not impossible, even if residences are nearby. Revitalization of edge cities may be "the major urban renewal project of the 21st century". In Western Europe, particularly in France and, Spain, the downtown has long been upscale and some suburbs (banlieues for example) are the slums. While this had traditionally not been the case in the United States, where non-rural poverty has been viewed as an inner city affair, by the 2010s, the United States started to mirror the Western European situation. For instance, much of Washington, DC has become upscale through gentrification, while suburban poor areas like Capitol Heights, Maryland have come into existence. Tysons (historically known as Tysons Corner) is seen as a modern prototype of an edge city. Tysons in its brief 40-year history has been given substantial redevelopment offers for the next 20 to 30 years. This particular area has seen a growing amount of interest as plans to make it an urban center were already begun in 2010. Private-sector development within the United States in combination with political groups have begun the planning process behind the redevelopment of Tysons. There are two forces at work in the creation of an edge city as it can be beneficial to both parties. With the redevelopment process taking place there has been an aggressive push to bring in businesses to Tysons. Edge cities such as Tysons have specific regional accessibility that has been enhanced by major projects funded by federal and state governments. One of the bigger enhancements to transportation specifically to Tysons was the construction “…of the Washington Dulles International Airport and an associated access road and the Capital Beltway but also expansions to state roads”. Location and transportation is important to the creation of edge cities, this city is an example of investments placed on the surrounding area. As for the future of Tysons, the plan remains to see the city become the downtown core of Fairfax County. There is a clear purpose to the investments and the future when investing into edge cities. To this point “…eight districts have been delimited, with four centered on new metro stations being transit-oriented development districts”. Future plans to transportation around the area continue to be made, the accessibility of the area is on the rise with many forms of transportation being formed. “The aims of the plan are for 75% of development to be within half a mile of metro stations, an urban center of 200,000 jobs and 100,000 residents, a jobs balance of 4.0 per household”. Many of these plans have been created in order to create a fully metropolitan city from a small town. The small edge cities progressively become larger with the creation of distinct plans. For many individuals the interest with edge cities lies in what they can show about new trends across city regions. Tysons is a prime example of the future of edge cities and what other small towns all around the world could become. Despite the lessons of the American experience, in rapidly developing countries such as China and India and the United Arab Emirates, the edge city is quickly emerging as an important new development form as automobile ownership skyrockets and marginal land is bulldozed for development. For example, the outskirts of Bangalore, India are increasingly replete with mid-rise mirrored-glass office towers set amid lush gardens and sprawling parking lots where many foreign companies have set up shop. Dubai offers another example. The emergence of edge cities has not been without consequences to the metropolitan areas they surround. Edge cities arise from population decentralization from large major core cities and has been ongoing since the 1960s. Shifts in socioeconomics in metro areas, location of metro industrial areas, and labor competition between edge cities and their more central neighbors have been attributed to their development and continued expansion. There has been a considerable debate among economists as to whether "jobs follow people or people follow jobs,"  but in the context of the edge city phenomenon, workers have been drawn from metropolitan business hubs in favor of the edge city economy. Developers of edge cities have been shown to strategically plan expansion of such business areas to draw workers away from more dense port cities and thereby keep profits from surrounding interests. As with any city, edge cities go through phases of growth and redevelopment. Politics within Edge Cities are unique in that they typically revolve around developing them.They contribute to a "growth machine" that spreads the urbanization of the United States. They can obscure smaller settlements that are also going through similar phases of redevelopment. Depending on the size of the settlements the modes of urban politics can change. "State interventions are important both conceptually and to the empirical matter of this article since the extent, timing, nature, and legacies of state interventions significantly shape the mode of urban politics in different places and in a single place over time". State interventions are essential to the politics in developing edge cities. Tysons, Virginia is an example that went through the process of development due to the county government's aggressive recruitment of businesses. Similar methods of development can be seen and applied to other edge cities as well. Tysons recruited businesses with the promise of growth in the future. More businesses coming in allowed for the city to grow which led to the businesses growing as well. A chain reaction was created which crafted the modern-day Tysons. This community was also an example of politics playing a role in developing an edge city. It could be traced to a special commission established at the request of the Fairfax County Board of Supervisors that examined the fiscal capacity of the County vis-à-vis perceived shortfalls in collective consumption expenditures (County of Fairfax 1976a). Edge cities contribute greatly to urban development by creating new jobs by attracting workers from the metropolitan areas around it. Also as a result of the rise of edge cities, more department stores, hotels, apartments, and office spaces are created. There are more edge cities than their downtown counterparts of the same size. Garreau states one reason for the rise of edge cities is that, "Today, we have moved our means of creating wealth, the essence of urbanism - our jobs - out to where most of us have lived and shopped for two generations. That has led to the rise of Edge City." In comparison with urban centers edge cities offer global corporations many advantages: cheaper land, security, efficient land communications, advanced technological installations, and a high quality of life for their employees and executives. The appeal of edge cities attract large corporations as well, boosting the already growing city. ^ Dunphy 1999, p. 573. ^ Garreau 1991, p. 7. ^ "The Curious Comeback Of U.S. Downtowns - Newgeography.com". www.newgeography.com. ^ Garreau 1991, p. 389. ^ Garreau 1991, p. 37. ^ a b Dear 2002, p. 17. ^ a b Phelps 2012, p. 671. ^ Mckee D. and Mckee Y. 2001, p. 171-172. ^ Mckee D. and Mckee Y. 2001, p. 177. ^ Mckee D. and Mckee Y. 2001, p. 180. ^ a b Mckee D. and Mckee Y. 2001, p. 183. ^ Garreau 1991, p. 114. ^ Garreau 1991, p. 116. ^ Garreau 1991, p. 113. ^ Garreau 1991, p. 99. ^ Garreau 1991, p. 261. ^ "Outside Every Metropolis You Will Find an Edge City". ThoughtCo. Retrieved 2018-04-03. ^ Lang and LeFurgy 2003. ^ Wiener, Aaron. "Poverty is moving to the suburbs. The war on poverty hasn't followed". Washington Post. Retrieved 7 June 2018. ^ a b Phelps 2012, p. 679. ^ Phelps 2012, p. 679-680. ^ a b c Phelps 2012, p. 683. ^ Ding, Chendri; Bingham, Richard (July 1, 2000). "Beyond edge cities: Job centralization and urban sprawl". Urban Affairs Review. 35 (6): 838. CiteSeerX 10.1.1.1031.1666. doi:10.1177/10780870022184705. ^ Henderson, Vernon; Mitra, Arindam (October 10, 1995). "The new urban landscape: Developers and edge cities". Regional Science and Economics. 26 (6): 613–643. doi:10.1016/S0166-0462(96)02136-9. ^ a b c d Phelps, Nicholas A. (2012). "The Growth Machine Stops? Urban Politics and the Making and Remaking of an Edge City". Urban Affairs Review. 48 (5): 670–700. doi:10.1177/1078087412440275. ^ "Outside Every Metropolis You Will Find an Edge City". ThoughtCo. Retrieved 2018-04-06. ^ "Glossary: Edge City | Urban Attributes - Andalusia Center for Contemporary Art". atributosurbanos.es. Retrieved 2018-04-06. Dear, Michael J. (2002). "Los Angeles and the Chicago School: Invitation to a Debate". City & Community. 1 (1): 5–32. doi:10.1111/1540-6040.00002. Dunphy, Robert T (1999). "Activity Centers". In Edwards, John D (ed.). Transportation Planning Handbook (2nd ed.). Washington, DC: Institute of Transportation Engineers. ISBN 9780935403336. Garreau, Joel (1992). Edge city : Life on the New Frontier (1st Anchor Books ed.). New York: Anchor Books. ISBN 978-0385424349. Lang, Robert E.; LeFurgy, Jennifer (2003). "Edgeless cities: Examining the Noncentered metropolis". Housing Policy Debate. 14 (3): 427–460. doi:10.1080/10511482.2003.9521482. McKee, David L.; McKee, Yosra A. (2001). "Edge cities and the viability of metropolitan economies: contributions to flexibility and external linkages by new urban service environments". American Journal of Economics and Sociology. 60 (1): 171–184. doi:10.1111/1536-7150.00059. Phelps, Nicholas A. (2012). "The Growth Machine Stops? Urban Politics and the Making and Remaking of an Edge City". Urban Affairs Review. 48 (5): 670–700. doi:10.1177/1078087412440275. John McCrory, The Edge City Fallacy: New Urban Form or Same Old Megalopolis?. This page was last edited on 23 April 2019, at 06:00 (UTC).